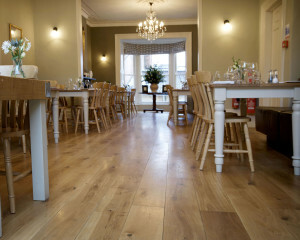 Oak Floors Online supply a range of engineered oak flooring products that are suitable for installing over Underfloor Heating (UFH); all of which are plywood backed to provide better strength and stability for this installation situation. We are also the innovators of ThruFlow technology, a revolutionary and unique new product line that is exclusive to Oak Floors Online. It is specifically designed for installation over UFH by implementing a predrilled plywood underside that reduces Thermal Resistance and allows the UFH below to work more efficiently and effectively, saving on heating bills. Our ThruFlow flooring is the ultimate product when combined with UFH, providing a beautiful finished appearance, high levels of durability, and all whilst maximising efficiency. Underfloor Heating is increasingly becoming an affordable luxury for many people, from first time buyers to people renovating and undertaking home improvements, with an aim of selling their property at a later date with increased value. Of course, you may simply want to benefit from the comfort that this type of concealed heating system will bring to your home, and you may be surprised to learn that you can actually increase your usable floor space, whilst reducing your heating costs via correct installation and ongoing maintenance of your complete heated flooring system. We have a full range of finishes available within our engineered oak that is suitable for UFH, which enables you to select an appearance that best complements your own style and taste within your home. This provides you with a wide choice of finish, whilst ensuring that the design and construction of your finished floor performs perfectly after installation is complete. If you do have UFH and like the sound of saving money on your heating bills every year, our ThruFlow flooring should be considered, having been developed specifically for use with Underfloor Heating. The predrilled plywood underside has been proven to allow the heat generated by your heating system to travel through the floor at a quicker speed, thus increasing and improving efficiency by up to 20%. Obviously this improvement in heat transfer throughout your floor increases energy efficiency and can reduce your heating costs over traditional wall-hung heating systems. 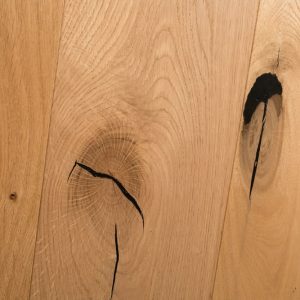 As mentioned above, ThruFlow engineered oak flooring is unique and exclusive to Oak Floors Online, and is available in both 15(4)mm and 21(6)mm thicknesses. Even the minimum 4mm wear layer on our 15mm thick ThruFlow oak flooring will provide excellent durability and long life, whilst maintaining the strength and structure that meets and exceeds the required industry standard. ThruFlow is the right choice for installation over UFH and will provide you with the very highest quality product for your home. 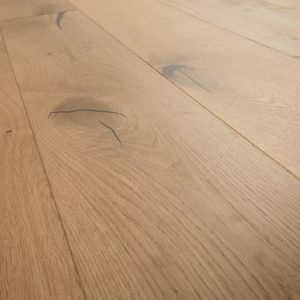 If you have any questions or concerns about installing oak flooring with UFH, or if you have heard anything negative about doing it, please call or email us and we will be more than happy to share our knowledge on this situation with you, in an aim of ensuring that you select the correct and most suitable product for your own personal situation. Whatever your requirements, we have a full range of guides available to help you to select the right flooring for you and to help you with care and maintenance of your floor after installation. We are always available to answer any questions that you may have, please do contact us if there is anything that we can help you with.